There’s green beer and there’s green beer. While regulars at Coleman’s Irish Pub in Syracuse, N.Y., celebrated the arrival of green beer for St. Patrick’s Day, a different sort of green beer was in the spotlight during the Oscars. With “An Inconvenient Truth,” the documentary featuring Al Gore on global warming, winning best documentary feature many celebrities added to the emphasis on environmentally sustainable practices arriving in fuel-efficient hybrid vehicles, and film stars Leonardo DiCaprio, Penelope Cruz and Salma Hayek hosted the third annual Global Green USA Pre-Oscar Party featuring their own kind of “green” beer. 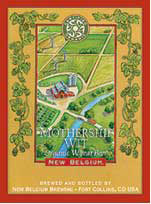 New Belgium Brewing’s first organic beer, Mothership Wit, and its signature Fat Tire Amber Ale were served at that party and several other pre-Oscare events. The Fort Collins beer also was served at Oscar-related charity fundraisers held Thursday and Friday to benefit the environment and other causes. New Belgium is 100% wind powered and otherwise a brewing industry leader in sustainable practices.